Cover art. (Original digital cover art including clone stamp). Staircase At The University is a song that appears on Morrissey's tenth solo album, World Peace Is None Of Your Business. The song was produced by Joe Chiccarelli and co-written by Boz Boorer. 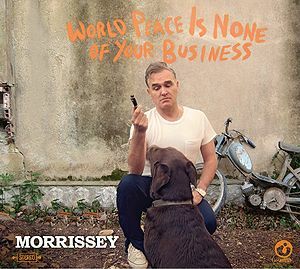 World Peace Is None Of Your Business was released on 15 July 2014. Cramming, jamming pack 'em in, ramming choc-a-bloc books power study, polish up and if it breaks your heart then don't come running to me cramming, slam 'in pack 'em in, ramming choc-a-bloc books power study, polish up and if it breaks your legs then don't come running to me. This page was last modified on 13 January 2015, at 17:53.